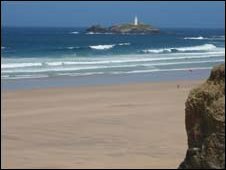 Auctioneers expect bids for the beach to start at about £50,000, with money raised going to Truro's Hall for Cornwall theatre. Although Virginia Woolf's 1927 novel is set in the Hebrides, the author used her recollections from childhood as inspiration for her most famous novel. And even though it is a century since those formative years, the view of the sea from Upton Towans beach is probably much the same now as it was then. The lighthouse too still stands proudly not far from the headland. But of course, other aspects have changed dramatically. In Virginia's day the huge car park, built to accommodate the vehicles of tens of thousands of tourists who visit each year, would not have been there. Neither would the shop and cafe - and certainly not the surfers encased in dark rubber bobbing up and down in the waves. The wide expanse of smooth yellow sand also make Upton Towans popular with families and coloured windbreakers often hide small groups, huddling from the wind. Behind the beach are the cliffs and sand dunes with long grass which nod and sway on blustery days, which are plentiful. Dennis Arbon used to own the 76 acres of sand and dune now up for sale. He bought it for the people of Cornwall to protect it from development. "Everyone who comes here is inspired by the vision of this wonderful beach," he says. "The sea conditions are superb - the light is amazing. The whole atmosphere is magical." Referring to the lighthouse, he says: "It's quite a landmark - many people come just to look at that. "They take lots of photographs from all angles because it's just such a perfect location." A few years ago Mr Arbon gave the stretch of land to the Hall for Cornwall theatre. The idea was that the land could be sold when the theatre needed more funding and it appears that time has now come. Auctioneers have already taken bids for the beach over the phone and there have been inquiries from as far afield as America and Russia. But there are conditions attached to the sale. Any potential buyer has to continue to allow public access and cannot develop the land. So who is likely to want to buy it? 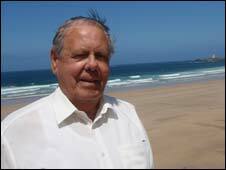 Mr Arbon hopes that it will be someone who loves Cornwall as much as he does. He is expecting bidders at the auction by Colliers CRE in London to offer something in the region of £70,000. Hall for Cornwall director Tim Brinkman says he is grateful for the funding the sale will provide - and he believes there is something fitting about this auction. "It's wonderful that something which inspired literature is going to help provide funds to feed plays and theatrical productions of the future," he says. "I'd like to think she [Virginia Woolf] would give this her blessing. Her creativity inspired here in Cornwall is helping to feed further creativity and work for writers in Cornwall. "I think she'd approve of that. I think she'd think this was the right thing to do."